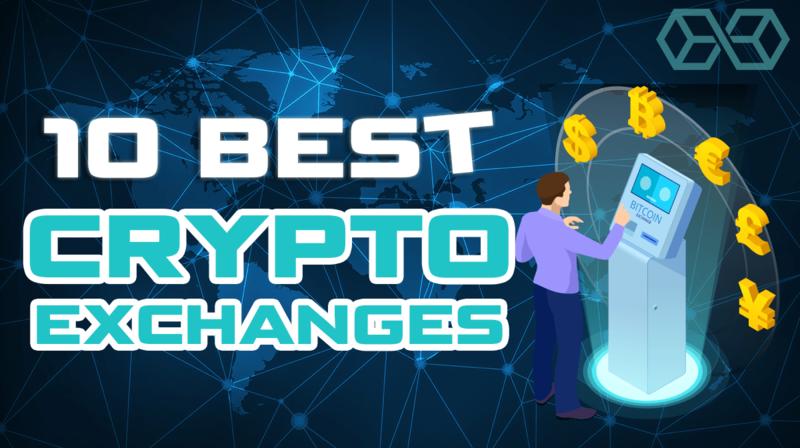 When trying to decide on the best cryptocurrency exchanges, it is not simply a matter of ranking by volume or performing a broad comparison according to fees, accessibility, trading tools or other common features. That is why we decided to offer a list of the best Bitcoin and cryptocurrency exchanges to cover the needs of all our readers. 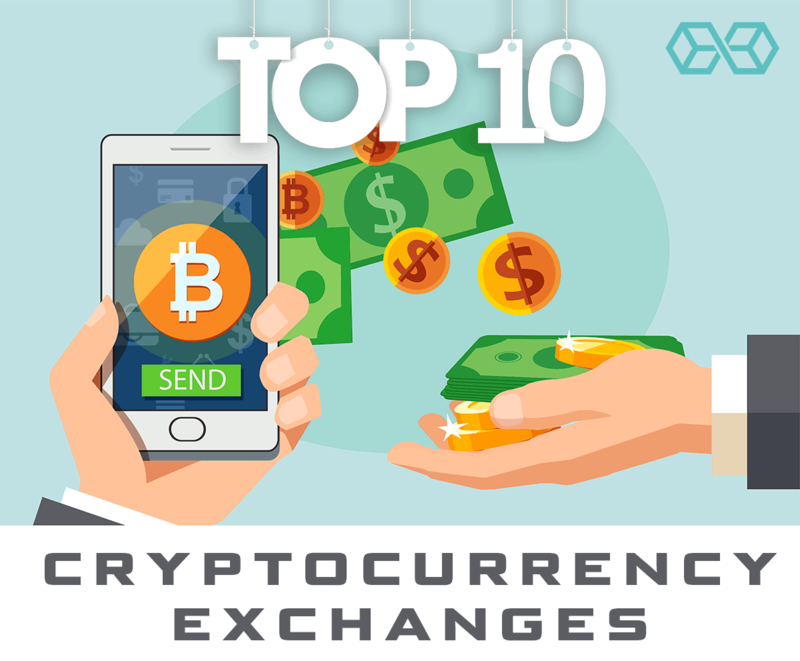 We will include the top major exchanges that offer the broadest range of services, as well as some smaller exchanges that focus on more specific types of clients. This way every reader will be able to find the best Bitcoin and cryptocurrency exchange for their unique needs. Coinbase was created to be the most trusted name in cryptocurrency exchanges, and in this respect, it is more or less unrivaled in the marketplace. Coinbase is regulated as a US financial institution, including FDIC insurance for US deposits of $250,000 or less, and is compliant with key EU financial regulations. Coinbase is also backed by major mainstream investors, such as banks and investment funds. 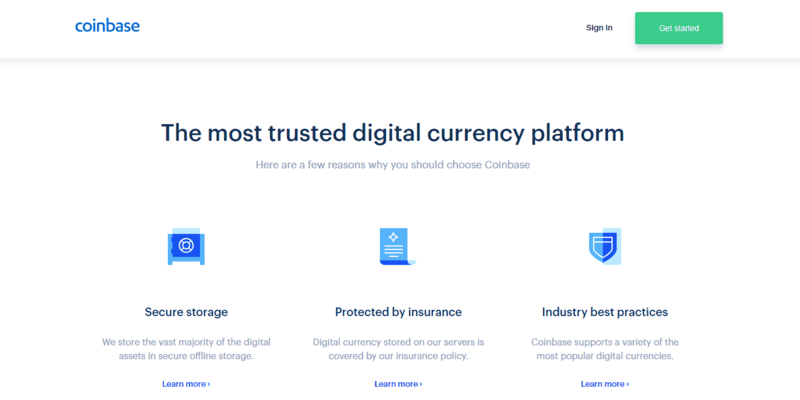 This level of trust ensures that Coinbase is the exchange of choice for most beginner cryptocurrency investors, and features a simple design to accommodate this client base. Unfortunately, this focus on trust means that Coinbase trades in only a limited number of cryptocurrencies, though it does trade in all the top names. Clients are also limited to a relatively small number of countries of origin in North America, Europe, and Oceania. 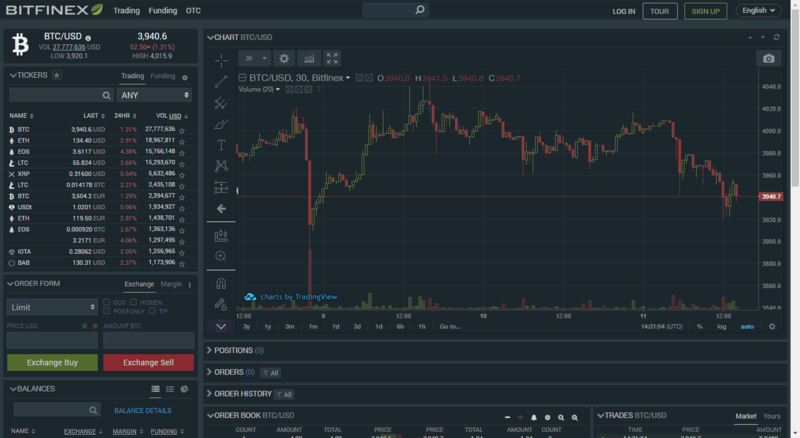 Binance was founded by Changpeng “CZ” Zhao, a Chinese software developer who previously built systems for the Tokyo Stock Exchange and developed futures trading software for Bloomberg’s Tradebook. Although originally based in China, a crackdown in regulations on cryptocurrencies there led the exchange moving to Japan. However, when Japan’s FCA issued Binance a warning they decided to relocate to Malta. Binance is the exchange of choice for coin-to-coin cryptocurrency trading with some of the largest numbers for available coin pairs and trading volumes in the industry. However, Binance flagship exchange also does not deal in fiat currency at all, making it a strictly cryptocurrency-based exchange. The base unit of exchange, then, is not USD, but rather Bitcoin itself. Note: Binance has also launched two fiat-to-cryptocurrency exchanges named Binance Jersey and Binance Uganda. Binance also boasts low fees for trades and withdrawals. 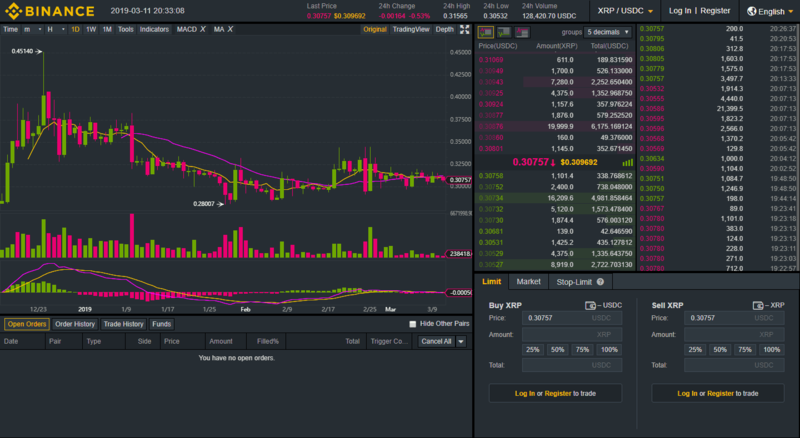 Trading fees are discounted if the user is holding Binance Coin (BNB). LocalBitcoins is a peer-to-peer exchange for trading between fiat currencies and Bitcoin. As a peer-to-peer exchange, LocalBitcoins acts as a medium between two parties who decide for themselves how many Bitcoins to trade, at what price and through which method. This means that people can make personal transfers of both fiat currency and Bitcoin while avoiding any regulations or taxes that they might face for making the same trade on a traditional exchange. LocalBitcoins allows people from all over the world to trade Bitcoins for any fiat currency based on a peer-to-peer system regardless of local cryptocurrency laws or financial regulations. LocalBitcoins operates by letting sellers place an advertisement for a percentage cost of the total value of the proposed trade. Buyers can then choose to trade with these sellers based on the offered terms. Buyers and sellers both have reputation scores based on past transactions, and users must decide for themselves whom to trust. CEX.io is a fiat-to-crypto exchange that offers some advanced trading features while still being very friendly for beginners to use. Otherwise experienced investors who are new to cryptocurrencies often use CEX.io for the kind of trading that they are accustomed to with traditional securities and platforms. CEX.io allows for free bank transfers for verified accounts and charges a small fee for unverified accounts using VISA or Mastercard. CEX.io also features low trading fees. Most CEX.io users are drawn to the advanced trading features that traditional cryptocurrency exchanges do not generally offer. CEX.io also offers margin trading, which is essential to many trading strategies. CEX.io does have a limited offering of cryptocurrencies, though it covers all the major coins. It also allows for a variety of coin-to-fiat pairs, including EUR, GBP, and RUB, which most exchanges do not. Bitfinex is among the most advanced fiat-to-crypto and crypto-to-crypto trading platforms, boasting some of the highest liquidity and trading volumes among exchanges. Bitfinex has few rivals when it comes to cryptocurrency traders who are looking to implement advanced trading techniques and trade large volumes. Bitfinex offers the full range of features that traders expect from a platform, including advanced order types, margin trading and a huge range of coins and fiat currency pairs. Bitfinex also boasts low fees that are geared toward high-value traders, with fees dropping dramatically as the trade value increases. Bitfinex has suffered two major hacks in the past as its massive volumes made it a prime target, but they have since paid back all losses to clients and significantly improved their security set up to be among the best in the industry. 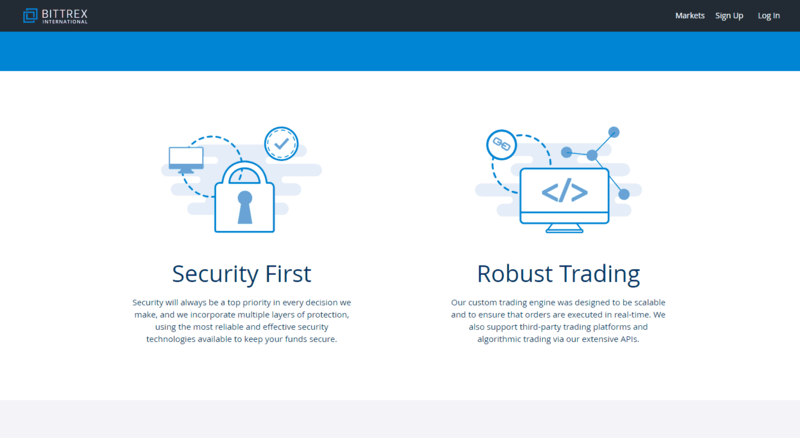 Bittrex is a crypto-to-crypto exchange that was designed with one priority in mind above all else: security. Bittrex was designed by a team with decades of experience in security for major software developers, such as Microsoft and Amazon. Bittrex also keeps most of its client funds in cold storage (inaccessible to hackers) and has a robust system for verification. In addition to security, Bittrex focuses on offering an enormous range of crypto-to-crypto trading pairs, with some of the highest trading volumes in the industry. While Bittrex may not be the first choice for experienced cryptocurrency traders looking to trade major coins, it is arguably the best exchange for trading less popular coins. Bittrex does have slightly higher trading fees than most exchanges and accounts can only be funded using Bitcoin, Ether or Tether. Coinmama is a simple cryptocurrency broker that offers users a quick and easy way to buy coins using fiat currency without needing to store them on a third party exchange. 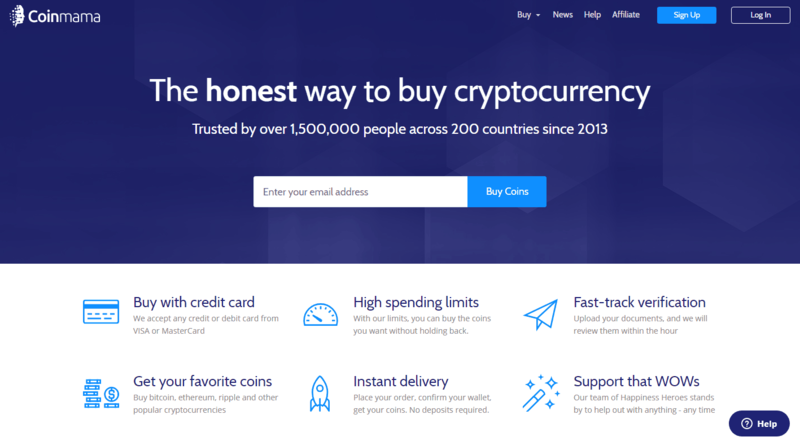 Coinmama is ideal for people who simply want to purchase a cryptocurrency using fiat money without delays, hassles, lengthy registration or hacking risk. Most often people will make an initial cryptocurrency purchase using Coinmama, and then deposit the resulting coins from their personal wallet into a crypto-to-crypto exchange. Coinmama does charge relatively high fees for its services, so it is only recommended for users that are willing to pay a premium for speed, discretion, and simplicity. Kraken is one of the oldest and largest cryptocurrency exchanges. It trades in both cryptocurrencies and fiat currencies, with a larger number of pairs available than most similar exchanges, though not by an enormous amount. Kraken is designed with advanced cryptocurrency traders in mind, though it does make an effort to be accessible for beginners as well. Advanced traders will find all the features that they expect from an advanced platform, as well as relatively low fees that scale down with volume size. Kraken did have some performance issues in 2018 that garnered it a slightly poor reputation, but it has performed problem-free since then. Changelly offers a rare service in the crypto space: fast and anonymous crypto-to-crypto transfers with no third party holding. Changelly is not designed for investing or trading, but rather as a fast, discreet and efficient means for exchanging the coins in your private wallets. Changelly works by offering you competitive exchange rates for a large range of coins and then making the transfer directly between your own private wallet. For this service, Changelly charges a higher fee than most trading and investing exchanges, but not excessively so. The premium paid is for the anonymity and simplicity compared to a more traditional crypto-to-crypto exchange. Changelly does also allow fiat-to-crypto exchanges, but these have notoriously high and opaque fees, and this service is not widely used. Prime XBT is a next-generation fiat-to-crypto exchange that offers cutting-edge trading tools, extremely high leverage and pooled liquidity from other cryptocurrency exchanges. This combination of features makes Prime XBT a top pick among advanced traders looking to capitalize on short term price movements in the top 5 coins. Prime XBT accounts can be directly funded with Bitcoin or indirectly funded through Changelly using fiat or other coins. Prime XBT offers by far the lowest trading fees in the industry, as well as the highest liquidity by drawing on the trading volumes from the top 12 existing exchanges. Prime XBT also has an extremely advanced interface, the ability to short crypto/fiat pairs and up to 100 times leverage, which is far more than the 2 to 3 times leverage offered by even the most competitive trading platforms. 10 Best Bitcoin & Cryptocurrency Exchanges  – Proven, Safe Exchanges was originally found on Cryptocurrency News | Blockchain News | Bitcoin News | blokt.com. Next Next post: Litecoin [LTC] & Dash Price Action: Double Divergence Setting Litecoin up for a Drop?